It had been a close competition amongst Leicestershire's best this year. Graham, and Alan Byron had each scored 5/6 in the County Championship and met on Thursday for a play off. Graham won one and drew one. The first was not that exciting and Graham held on well in an ending and in the second I sacked a piece for two pawns and the attack but he defended well and I blundered an exchange which meant it was a rook for a pawn and curtains! I'm pleased for Graham though, I thought he played the best chess this year. A good result for HA1. A bad result for HA2. My Bxh7+ sacrifice on move 9 probably didn't help. On Tuesday, 1st November, HA2 play at home against Syston 1. On Wednesday, HA1 play away against Melton 2. There will also be a club night on Tuesday. Well apart from yours truly we were heavily outgunned by Latimer (Drew was 80 points below his opponent) the upshot being that we needed a point to secure victory. They obligingly lost the toss and being the unselfish guy I am, I chose white for me! I did presume correctly that it would be up to me. When Mr Colver went completely wrong in the opening, yippee! Gordon lost very quickly and disappeared, so I have no report on that. Michael and Drew battled on courageously against a lot stronger opposition and although they both succumbed should take heart that they made their opponents work for their spoils. So although we lost 3-1 the 2.5 points generously awarded to us meant victory which pleased Drew especially! HA1 are now playing their league cup match on Tuesday 25th October. Thanks to The Swallow agreeing to the switch because we couldn't field a team on 27th. Graham Sharpe will play his County Champs play off against Alan Byron on Thursday 27th October at Wigston. Good luck to him - spectators welcome. The County First team annihilated Greater Manchester - several HA players were in action. Somehow, i have managed to force a play off in the County Champs (Major Section) with Bob Collins and David Reynolds. This will be played at Wigston on Thursday 24th November. The season has only just begun, but half term is already upon us - this means no chess next week. This will then be followed by the first round of the League Cups, and then a return to League Chess the following week. I will be e-mailing the HA2 and HA3 squads to sort out the Cup fixtures. Congratulations to The Grinder, by the way, for achieving a grading prize at the Atkins. A steady start for all concerned. I got into a great position against Howard and set myself up for a sacrifice then got cold feet and my position was dead. Howard offered me a draw, i checked on the other games: Rob was better, John was even, and Ray a pawn down but solid. Then Mr Clay inadvertently sacrificied his queen so i shook my opponents hand and then Mr Bailey thought his queen needed sacrificing as well! Game over. Ray did his best to lose, but Brian just wouldn't let him! So a 3-1 victory. HA3 were away at Syston (Against Syston 3. Syston 4 are in the same division). The evening started with Stuart Hollingworth hitting Haka Dave over the head with a book and telling him 'don't look at me like that'. Apparently this knocked some sense into him as Dave was the only one of us to come away from Syston with anything resembling a point (or, actually a half point). Dave managed a miracle draw having been an exchange and three pawns down - he was the first to finish. Drew started well against Stuart, but lost out in the end. 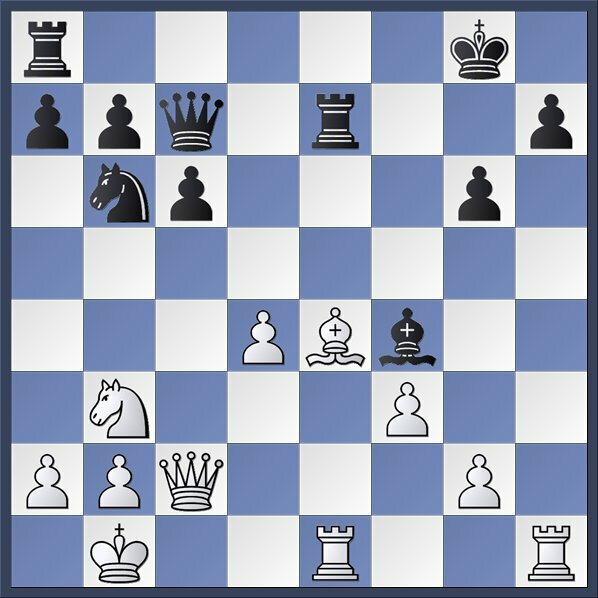 Having been a pawn up from a Steinitz Defence Ruy Lopez, I proceeded to mess things up and lose the pawn back - followed a little later by a rook. Michael lasted the longest and was outplayed in a minor piece endgame by the ever solid Ron King. All the teams are in action again this week. On Tuesday 11th October, HA1 play at home to Melton 2. Anybody who is free is welcome to come along and watch, but there is unlikely to be a club night. On the same night, HA3 play away against Syston 3. On Thursday 13th October, HA2 play away against Hinckley 1. The Leicestershire annual tournament attracted over 100 players and was ably controlled by Andrew Morely [sic] and his team. As some of you will know, I was drafted into the HA1 team at Ashby last night - payment in kind for a room at the inn known as Graham Booley's house. So down I drove from Sheffield whereupon I arrived in Ashby around 7pm. Feeling peckish, I enjoyed the delights of Chicken Donner Meat and Chips in my car before braving the torrential rain and dashing into the Ivanhoe club. My opponent was Chris Tipper, an old foe whom I seem to have the Indian sign over. He plays the Birds, and opening I never know what to do against as you will see. 1. f4 d5 2. 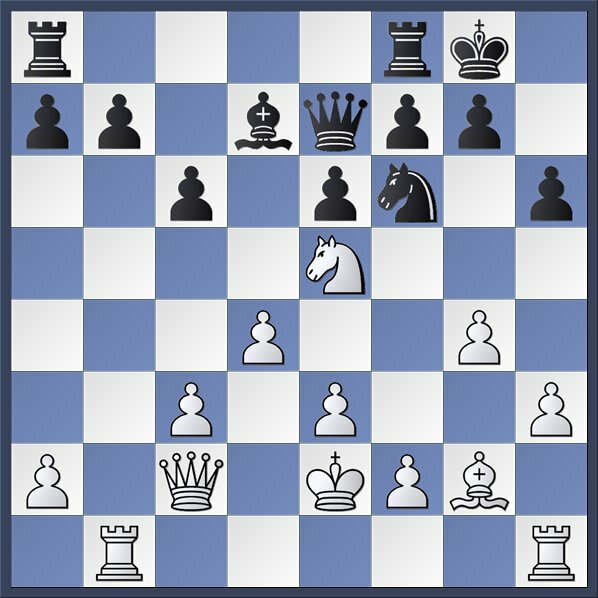 Nf3 Nc6 3. e3 Bg4 4. Bb5 a6 5. Bxc6+ bxc6 6. O-O e6 7. Qe1 Bxf3 8. Rxf3 Nf6 9. d3 Be7 10. Nd2 O-O 11. Kh1 c5 12. e4 c6 13. e5 Nd7 14. Qg3 f6 15. Qh3 f5 16. Nf1 Rf7 17. Bd2 Rb8 18. b3 g6 19. Ne3 a5 20. g4 Rg7 21. Rg1 Nf8 22. Rbd7 29. Rd3 Qxg2+ 30. Rxg2 Rxd3 31. cxd3 Rb7 32. Bxa5 Bxa5 33. Nxa5 Rb4 34. Kf7 41. d6 Ne6 42. Kg2 Ra3 43. Nc6 Rc3 44. Nb4 Rc4 45. Nd3 Rd4 46. Rf3 Ra4 47. And so I arrived at the Leicester Congress in a non-playing capacity, having been roped into assisting with the running of the congress. After circulating around the college for half an hour trying to find the entrance, it was probably better for my rating that I wasn't playing, but over the whole weekend, I couldn't help but feel that I had missed out. So wandering around various games was very interesting, with the odd nod of the head to Haka Dave, watching Ray, Colin and Rob proved to be very entertaining. I think I spent most of the time in the Minor room seeing who had messed up a position first. (Usually Ray). Wandering round the Major and Open room was more a case of looking at the boards pretending to be in authority than actually knowing what they were doing. That's probably why they are better than me at chess. I think that Colin can be very pleased with his Congress, I felt that he may have been in for a prize, given his first 3 sessions, it was a shame to see him lose his momentum. I felt that Rob was a dark horse for the congress, one to watch, an emerger from the light (you get the picture), and I am not sure that he took any money home either. And that leads to Ray, good old Ray, giving pieces away and losing on time to Paul Martin in the closest bullet type finish that I have ever seen. He did the Gentlemenly thing and resigned. A disappointing congress for Ray. Having said all of that, fair play to everyone that entered, braver souls than me and I hope that the entrants gained more out of the tournament than I did (I gained sore legs from so much standing and walking and a new chess scorepad). Suffice to say that I will look forward to trips to Heathcote Arms later in the League season, Web Guru Colin, Haka Dave and Raymondov are always good for a laugh off of the chess board and I look forward to seeing you all again. As previously alluded to by Colin in his earlier post about his Curate's Egg of a performance at the Atkins, I was a controller last weekend. As in previous years I had poled up on Friday afternoon to move tables and set-up boards, pieces and clocks. Having (eventually) got through the College reception, by fleeing the fierce receptionist by sneaking out the door and wandering around the back of the building I found Andy Morley, the Tournament Head Honcho in Sean Hewitt's absence, already hard at work. Ben Vaughan had previously agreed to assist, but of him there was no sighting. (At this stage I wondered whether he had gone to that mysterious chess nirvana – Wyldland.) However, Hayley (sorry – don’t know her surname) did show up to assist. In addition to being an extra, enthusiastic, pair of hands, she added some glamour and brought our average age down considerably. We were set up in good time, and once we’d finished Ben put in an appearance. (Better late than never…) At this stage Andy gave me my badge. Frankly, I was surprised that I was a controller, but having given the matter some thought, it is clear that Andy couldn’t get “Table Shifter, Setter-Upper & General Factotum” on a reasonably-sized badge. He’d obviously been on that training course about valuing employees, by giving them an important-sounding title and a badge. However, he didn’t fool me, cos I’ve done that course too. As people appeared, my newfound status seemed to amuse one or two. (Well rather more than that – Colin, John, Rob, Steve Wylie, Stan Parsons, Andy Carter all spring to mind, to name but a few.) It also became clear that the badge made me a lightning conductor – on Friday evening, I received volleys from people about the lack of signage on the front of the building (fair enough) and the roadworks (not a lot I can do about that, folks). For the first round, we’d made a faux pas in that all the clocks were set to 80 minutes rather 100 minutes. I’ll plead a Nuremberg defence – we were just obeying orders, weren’t we Andy? There was some interesting chess on the Friday night. Although I spent the majority of the time in the Minor room over the weekend, on Friday night I saw some of the game on the top board, where Mark Hebden was playing. He didn’t seem completely focused initially, and Mr. Morley noted fairly early on that that a win wasn’t going to be routine. (I wouldn't have dared venturing any opinion from where I stand in the chess food-chain.) In fact the game finished as a draw, making the Open section interesting for the rest of the weekend. On Saturday morning after the first half an hour I bailed out to have a mosey around the fleshpots of sunny Leicester. After lunching, I returned to find that there was still one Minor game going on – surprise, surprise, it was Colin Ross. As noted in his blog, he spawned the most amazing win. Saturday afternoon saw both Colin and John drawing, in wildly differing circumstances. Colin agreed something verging on a Grandmaster draw, to keep his powder dry for Sunday, whilst John had ground out a small advantage in an endgame. It was the sort of situation that that you’d bet your house on John, but on inexact move led to the game ending in a draw. Ray, having lost in the morning, had a full point bye in the afternoon. I turned up rather tardily on the Sunday morning, having taken the opportunity of going for a long run first (healthy body, healthy mind – I hope). At this point, it was clear that the Heathcote challenge for the Minor was hitting the buffers. Both Colin and John lost. John’s opponent, one of the eventual winners, rather comprehensively beat him up, and John tipped her as the winner. Frankly, I can’t remember what happened to Colin. Rob won again - being the last match in the Minors to finish, to get to 3 points. Unfortunately Ray lost again. The other highlight of Sunday morning was seeing my fellow controller Ben resplendent in a white outfit looking, for all the world, like a walking advertisement for Persil or Daz. (Important! Other soap powders are available.) I was called into action by one of the younger competitors who needed help in opening his water bottle. I was also called into action to reset clocks – unfortunately, I cocked that up on one occasion, by moving one of the player’s clock to twenty to rather than twenty-five to. What a pillock. I also took an interest in the end of that game, as there was a time scramble, with the win occurring with less than 1 minute remaining. After the game, one of the spectators (no name, no pack-drill) took me to task for not intervening as he felt that the player short on time wasn’t playing fair, but his opponent didn’t complain, and I didn’t believe that there was clock abuse. The final round of the Minor produced a win for John but losses for everyone else from the Heathcote. As a result Rob missed out on third place. Ray had the (dubious) honour of being the last game in the whole tournament to finish, his grindfest against Paul Martin finishing with Ray resigning very shortly after Rajan’s game in the other hall finished. Can't give you an exact recollection as i was too engrossed in losing against Alan Jex. I was three pawns up but after playing really well i ran out of time . He had offered me a draw earlier but he was the said three pawns down . Rob had too many horses in his stable so he gave one away . John won comfortably, i think. Ray and his opponent were at Julian Clarys nightclub , queens all over the place ! In the end 2-2 and an apology from your captain. Welcome to Gordon who played his first competetive game for us. The best performance of the night was from Gary, who, although material down, put up a decent fight against Amber. Michael started well, and had some well placed pieces, but overlooked an attack in the centre of the board and then had cause to regret not having castled. Drew played against Peter, a new player for the Red Admiral with an Eastern European accent. Most of the time that Peter had used on his clock was from forgetting to hit the clock - he used hardly any thinking time at all. He might turn out to be a smidge stronger than 80. On the night, Gordon was outplayed by Andy, but did fine with the clock and recording the moves. Our next match is on Tuesday 11th. The handbook says that this is a home match, but, in fact, it will be played at Syston. The first surprise of the weekend was that Haka Dave was at the Atkins. The second surprise of the weekend was that he was wearing a badge with the word 'Controller' on it. I will not steal his thunder, but leave Dave to describe his experiences in a separate blog. 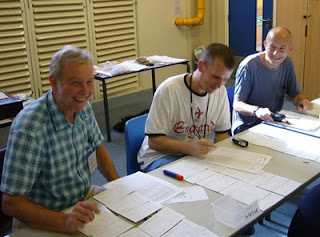 If anyone else wants to e-mail me any info about their weekend at the Leicester Chess Congress, i will post it here, too. My kingside was looking vulnerable and my pieces were not very active. My b pawn was under threat from the white Rook. Time to do something, but the b pawn also needs to be protected. 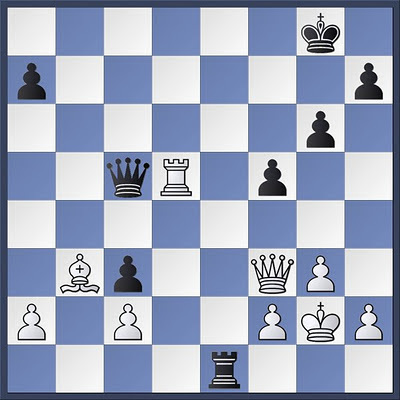 18...Qa3 gets the queen out and also indirectly defends the pawn, but Terry missed this and played 19 Rxb7. Then i played 19...Qa6+ winning the rook. The game went on for another 33 moves. I had to skip around some stalemate tricks later on, but the damage was done. 1 point out of 1. This game almost went to the full four hours. In this position, i had just offered my opponent a draw and had that declined. At this time, I had two minutes left on the clock and my opponent had ten. Both pawns were Rook pawns and there was no way that either of us would have been able to promote them. 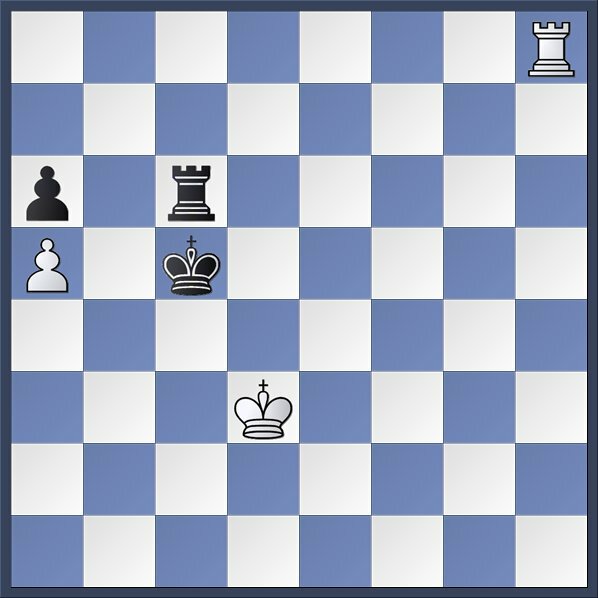 If anyone is better then it is me with the black pieces, but even then all white has to do is get his king in front of the pawn. White now blew it completely with Rh6 - putting the rook on the wrong square and then releasing it. My opponent had meant to play Rh5+, but instead gifted me his rook - and then, realising what he had done, resigned. 2 points out of 2. Things are going well. In the afternoon, i was placed on board 1 with the white pieces against Gavin Hart - the eventual joint winner of the Minor tournament. Gavin's bishops and queen had been giving me some hassle for a while, but, so far, i had been able to deal with this and pick up an extra couple of pawns. I was by now, however, extremely tired (weekend congresses are endurance events as much as anything else) and conscious that i might very well make a mistake, so i offered my opponent a draw. This was accepted. Two and a half points out of three put me in a very good position at the end of the Saturday. On Sunday morning, the leaderboard had seven of us all on two and a half points - very close. 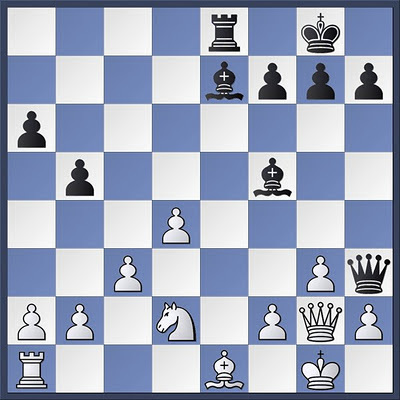 With the white pieces, 25 Rh4?? (intending to double up on the h-file) allowed 25...Bg3 forking my two rooks. Disaster. Two and a half points out of four. By now, i was playing down on board 6. I was in trouble almost from the start. I carried on, however, until this truly horrible position was reached when resigning was definitely the least painful thing to do. The final result for me was two and a half points out of five - about what i usually get, but, after a great start on the Friday and Saturday, i had been hoping for more.